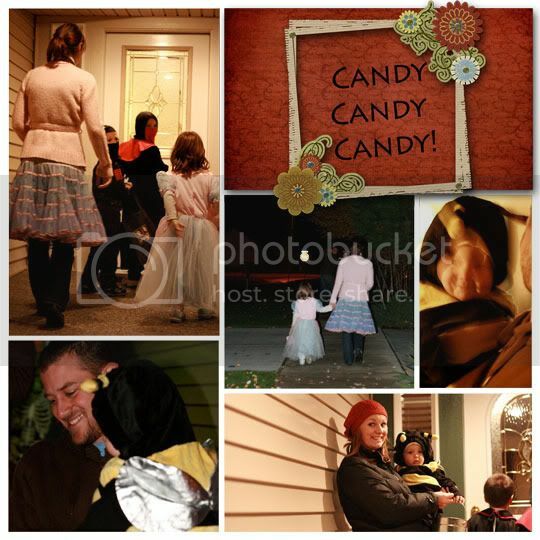 Kissing the Joy as it Flies: Trick or Treat! So Halloween was 10 days ago and I'm just now getting around to the photos. Story of my life. Roasted pumpkin seeds, marshmallowy popcorn balls, carved pumpkins, and an 18-month-old dressed up like a large striped insect. Good times, baby. But despite the pumpkin seed flub-up, trick or treating went off without a hitch. They started the evening by practicing their trick-or-treat technique on our house. And once Mr. B saw what happens when you stand outside the door, he thought he better give it a try too. He was not impressed with the graham cracker I tried to give him instead of a candy bar. So he decided to make a hasty retreat down the stairs. Given the opportunity, this kid makes a beeline straight for Canada. Pardon the pun. I then tried to wrangle all four costumed boys for a quick photo. Easier said than done. Hey, Haydn, can you hold on to B for a minute while I get your brothers out here? Better to just set the troublemaker free and deal with the cooperative ones. But while I was distracted, Brecken discovered a new game. Gotta love that action shot. I didn't even realize he was throwing something until the pumpkin nailed me and I looked at the picture I had just taken. so we invited them over to share our neighborhood. Everything is more fun when you do it with friends. A good time was had by all, and Jarrod only got the stinkeye from a couple of little old ladies. He was using his toddler as a prop to fill his own bucket with candy. That is the cutest little bee I've ever seen....and I love your photo collages!